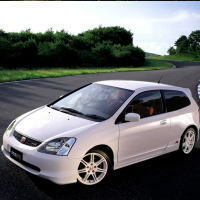 honda civic type r ep3 - J's Garage Export Co., Ltd.
2001. 10 : Honda announced the release of the EP3 Civic type R in Japan on October 18.The Honda EP3 Civic type R is powered by the improved K20A 2.0-liter DOHC i-VTEC engine with 215 horsepower and adopts a close-ratio 6-speed manual transmission. The Honda Civic typeR is equipped with aeroform bumpers, RECARO front bucket seats, a MOMO leather wrapped steering wheel, a dash-mounted aluminum shift knob, type-R emblems, and SRS dual front airbag systems. The K20A 2.0 liter DOHC i-VTEC engine employs VTEC which adjusts intake/exhaust valve timing and lift at high engine speed and VTC (variable timing control) which continuously varies the intake valve timing phase in accordance with engine load. Exhaust gas back-pressure has been reduced through the use of a dual exhaust manifold, large-diameter piping, and high-volume mufflers. And the engine has been equipped with a short intake manifold with equal-length ducts, high-rev-compatible contenting rods, and a super-rigid crankshaft. The close-ratio 6 speed manual transmission uses synchro-mesh cones in all gears (triple cones in 1st/2nd, double cones in 3rd to 6th.). And a torque-responsive Helical LSD was adopted. The body has 20% higher bending and 80% higher torsional static rigidity than the EK-9 Civic type-R. Chassis design includes front toe control link strut suspension and rear reactive link double wishbone suspension. This combines with the VGR (variable gear ratio) and EPS (electric power steering). The Civic type-R features aeroform bumpers, Recaro front bucket seats, a MOMO leather wrapped steering wheel, and a dash-mounted aluminum shift knob, and type-R emblems. An SRS dual front airbag system is standard equipment. 2004. 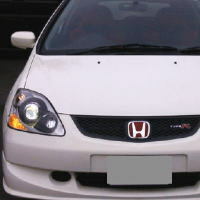 1 : The Honda Civic type R got mild face-lift including new front bumper design, 6-lights type projector headlights, rear combination lamps, and red and black two-tone color RECARO seats. And it is equipped with the immobilizer. The silver metallic body color is added for the C-package.